John Deere Constituent Sensing will ensure higher silage preservation quality and feed cost control through less silage spoilage for higher farm output (milk production optimization, lower cattle illness rates, and energy production optimization). Test forages monthly, weekly, daily, or how often you want. Measure not just the silage dry matter but also starch, protein, acid detergent fiber (ADF), and neutral detergent fiber (NDF) before detecting a change in the yield of milk. Improve the ration accuracy and ration cost effectiveness. The ability of continuous measurements with HarvestLab™ sensor and John Deere Constituent Sensing help to control the adequate fiber content in the ration. Also prevent unexpected milk fat depressions and subclinical acidosis. In addition to fiber, starch can be measured and monitored at the same time. Keeping the starch level consistent is essential for proper rumen fermentation. John Deere Constituent Sensing allows precise measurement of corn, haylage (alfalfa), and small-grain silage (whole crop silage) constituents - starch, crude protein, sugar and acid detergent fiber (ADF)/neutral detergent fiber (NDF) – within just a few seconds. 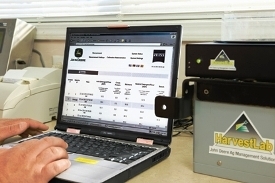 The HarvestLab™ sensor provides > 4000 measurements per second. This feature provides permanent data gathering all over the field. The results are available while harvesting and help in decision making about adjusting harvesting time and crop conditions. In addition, that helps growers and/or contractors in organizing the workload and billing processes. 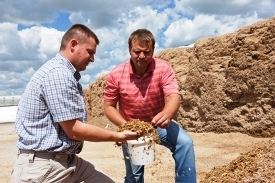 While harvesting, the forage quality amount can be documented and monitored all the time. Complicated harvesting decisions can be made much faster, if specific fields are preferred or not. Monitoring the forage amount helps the user to make educated decisions on what will go in the silo stock and what will be used later on in the feed rations. For example, based on the documented harvesting values, variety selections can easily be done for the upcoming season. Decisions can be taken according to individual grower circumstances and conditions to increase the forage amount in the next year, if needed. 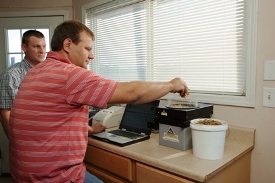 With documenting the specific constituent values, growers know immediately the organic matter that was harvested. This is fundamental in managing soil quality. 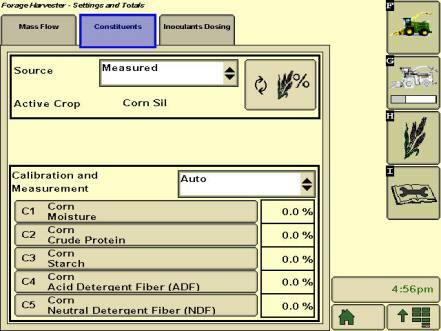 The fertilizer usage can be adjusted as a result. Specific fertilizers can be used according to the individual grower’s requirements with the ability to manage direct inputs; there is direct cost savings to the bottom line. John Deere Constituent Sensing aids in the automatic adjustment of the silage additives rate according to the ingredient readings from HarvestLab. This will ensure higher silage preservation quality and feed cost control through less silage spoilage for higher farm output (milk production optimization, lower cattle illness rates, and energy production optimization). Initially corn, with other ensiled crops to follow, is included in Constituent Sensing.